An Uprising Leader in Minecraft Hosting, VPS/KVM Hosting & cPanel Website Hosting. Aquatis is an uprising Leader in Minecraft Hosting industry. We strive to give our customers a unique hosting experience like no other host offers. We are always improving our host with constant updates to eventually be number one! Features included with our Minecraft Hosting Services. Unlike other Minecraft Hosting Company’s, Aquatis provides a lot of beneficial features that make us unique from the competition. Listed to the right are some of our features! Your personal information is safely stored with us. We always keep our security up to date. With our custom MySQL Database Manager, You don’t get limited to one on Multicraft. With our player monitor, you can view a live chart of your server players peak hours! We try to help you the best way we can all the time! We’re always having fun doing so! We backup your server daily so if anything ever happens we can restore your server fast. Don’t like the location your server is at? You can move your location for free automatically. Worried about your bandwidth usage? Don’t worry, we’re not metered, same as you. All Aquatis customers are given an opportunity to get a free 30-day Ultimate Buycraft Trial from us. Buycraft is the most popular webstore solution for Minecraft Servers. Buycraft has no limitations on how you’d like your webstore to look and function, you’re sure to be up and running in no time. You even have the option to customize the HTML of your webstore for those who want to go one step further. Clicking the button below will redirect you to there website and give you the Free 30 Day Ultimate Trial! AquatisManager is a custom developed interface free for all Minecraft Hosting customers. 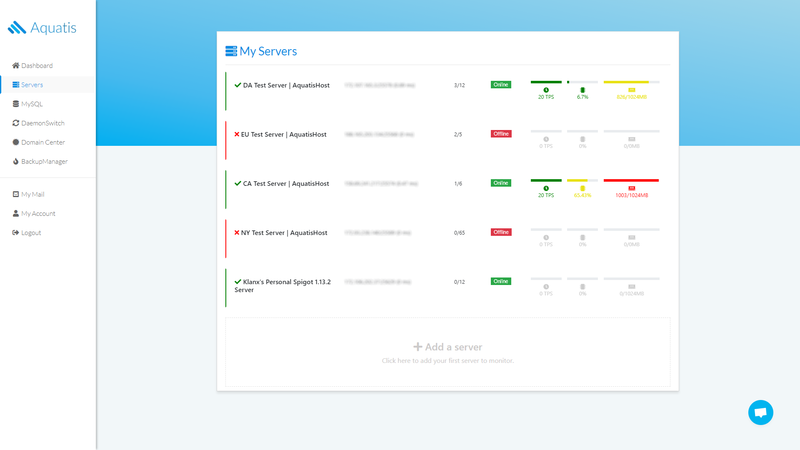 AquatisManager keeps track of your Servers TPS, CPU & RAM usage to ensure everything is stable. AquatisManager also allows clients to create multiple MySQL Databases unlike multicraft which only provides 1 per server. Additionally, customers can also change their server’s location all done with a few clicks! Finally, customers can also get a built in guide in the Domain Center on how to point your domain to your server. Frequently Asked Questions by our customers/community. We've build this little section down here to help customers with any questions. I didn' t get an email with my Server Details? Sadly, Mail hosts like Google/Yahoo & Hotmail still sometimes mark our email as spam. We'd recommend you check your spam inbox for any emails from us. If your having issues finding any emails, try to search for emails from [email protected] as that's where all of our alert emails are sent from. My VPS server has been pending for an hour? Sadly, SolusVM, the software developers who made the panel to control your VPS server, failed to make a proper working API. Usually, the Staff at Aquatis have to manually provision your server for you. If your server has been pending for more then 2 hours, contact our support team. How long does it take for my Minecraft Server to provision? Usually, as soon as you pay the invoice, our system will automatically provision your server and send you an email with your server details. This usually happens within 30 seconds. If the server is still pending 10 minutes after you paid it. There may have been an exception while making your server. We'd recommend you contact us to get it resolved. How do I login to the Multicraft panel? You simply can visit https://panel.aquatis.host and login with your details. If you just ordered the server and its your first time logging in, you have to go into your email and use the details found in it. The subject of the email should be AH | New Server Assigned.